Victor: I can fix that. This may be one of the more ironic results of the old saying, “If at first you don’t succeed, try try again,” when it comes to filmmaking. Back in 1984, director Tim Burton was fired from Disney for making a live-action short called Frankenweenie, which was deemed ‘too scary’ for children. Now, for whatever reason, whether it’s the change in regime at Disney since the 80s or because of Tim Burton’s higher standing in Hollywood, he has been able to revisit the story he developed and co-wrote and turn it into a feature-length, stop-animated feature for mass audiences to enjoy. 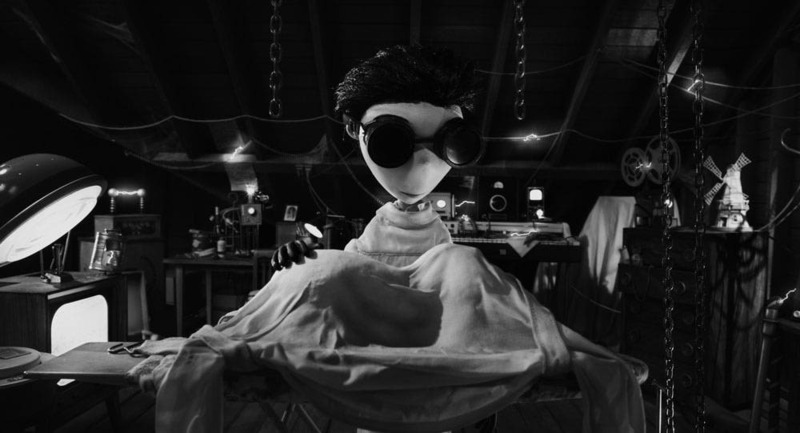 The results are decent enough, as the film is entertaining and light, in a Burton-y sort of way, but confining the original idea to a shorter length may have been the best call in retrospect. Still, the film is certainly enjoyable and one of the better features from Burton in a while. 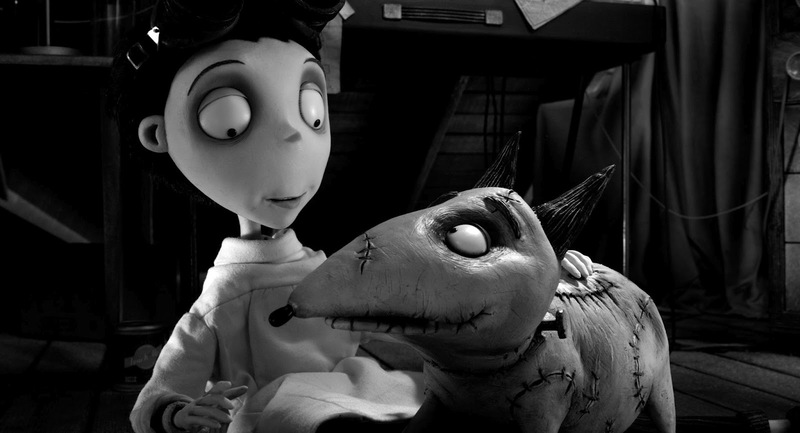 While playing as a kid-friendly homage to Mary Shelly’s Frankenstein, Frankenweenie is really the story of a boy and his dog. Victor Frankenstein (Charlie Tahan) is a child scientist of sorts, who enjoys doing science-y things and making little movies, using his best friend in the world, Sparky, as his closest associate. Sparky is Victor’s dog, a bull terrier with plenty of energy, but things take a terrible turn due to an unfortunate car accident. 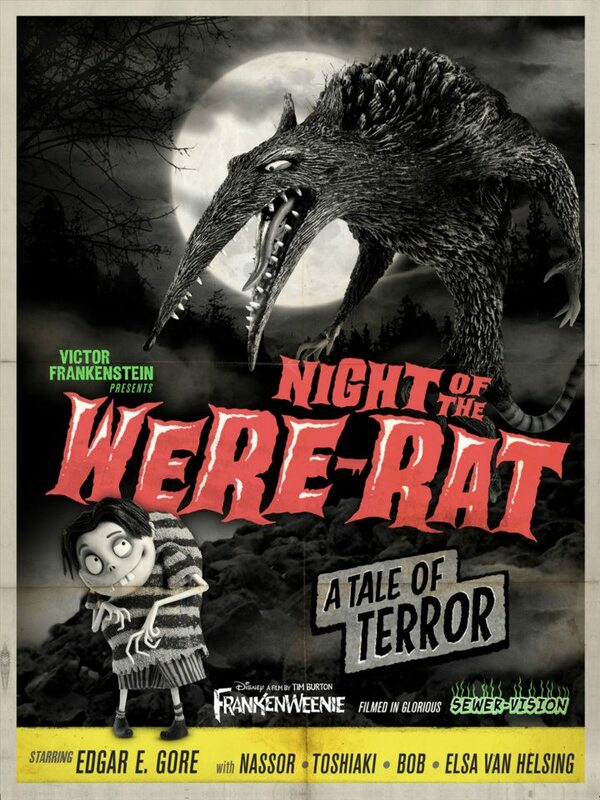 Incredibly saddened, Victor finds a spark of hope from his science teacher, Mr. Rzykruski (Martin Landau), who presents an example of electricity bringing life back to a dead frog. 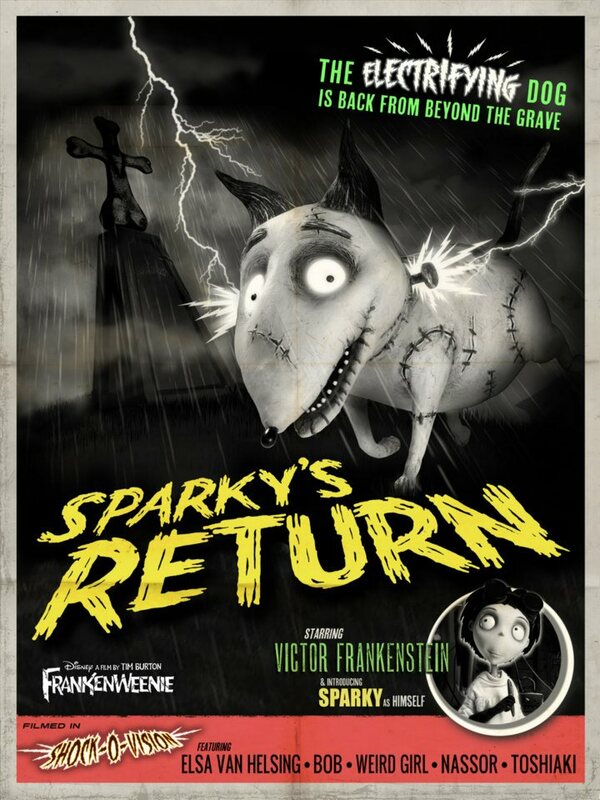 That night, Victor retrieves Sparky from the pet cemetery and goes home to expand upon this example by setting up an elaborate environment in the attic that will focus the power of lightening into Sparky and hopefully bring him back to life. 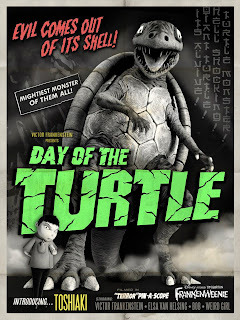 Victor is successful, but intends on keeping Sparky a secret from all, until his classmates find out and decide to create their own science experiments, possibly with disastrous results. The film features many Burton regulars in the supporting cast as well, including Winona Ryder as Elsa van Helsing, the girl next door; Atticus Shaffer as Edgar “E” Gore, one of Victor’s classmates; Catherine O’Hara as both Victor’s Mother and the “Weird Girl” from Victor’s class; and Martin Short as Victor’s father and Mr. Bergemeister, the grumpy town mayor. All of these characters and more make up the town of New Holland, where this film takes place. This setting fits in the same way that Edward Scissorhands was setup as a calm-looking, suburban neighborhood, with something mysterious on the big hill behind it, like a giant house owned by Vincent Price or an old windmill, as seen in this film. 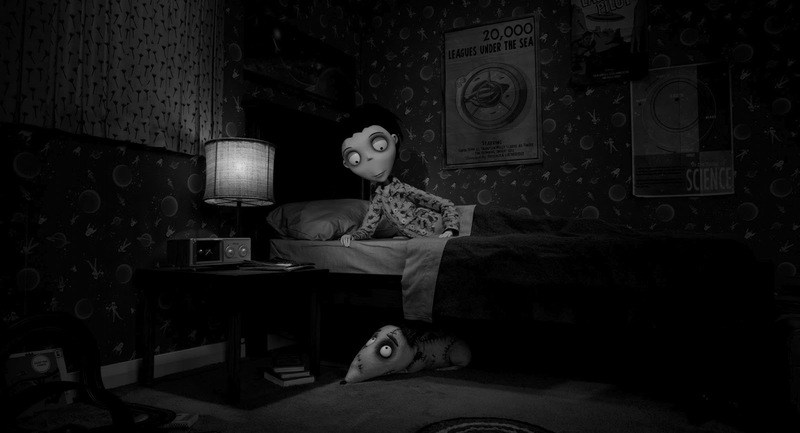 There is certainly no problem with the animation in Frankenweenie. 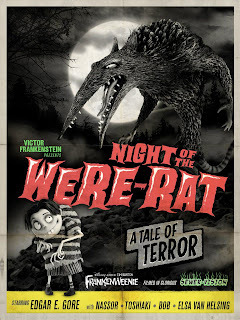 Presented in black & white to further connect it with the Hammer Horror films it takes inspiration from, the film has a wonderful presentation of its characters and environments, which have a definite Tim Burton feel, but still seem like original creations. 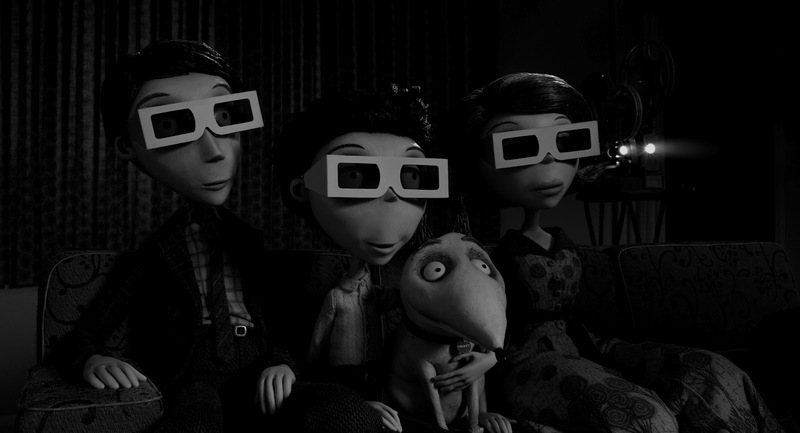 As a stop-animated feature, the movements are all smooth, but the little moments, with things like hair follicles seeming slightly different in each frame, lend an authenticity to the production overall, which suggests plenty of care being taken to make the film look great, while still having the feel of a film made by hand. 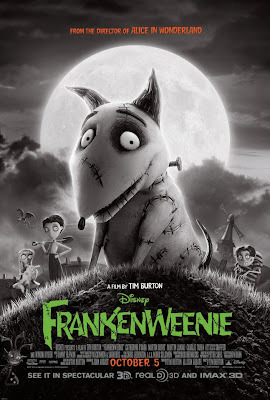 True to Tim Burton’s style, the humor in this film, while being aimed at children, has plenty of morbid moments that is funny in itself, given that this is a Disney film that managed to let certain things get by. That said, I feel like kids would laugh a lot, due to the interactions between the kids and their pets, certain sight gags that occur, and of course Sparky, who is a fun presence throughout. 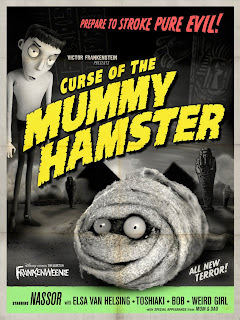 I should mention that the film does have some moments that could be deemed ‘too spooky’ for the young ones, but I can’t say I can judge every kid’s reaction to the film. I will just say that some of the more wild creatures that rise from the grave are depicted in a creepier way than I think I would be comfortable with if I were younger. Where the film falters is in its attempts to be about something and find a fitting conclusion. The reason the short film works is because it gets to its point quickly, has its fun, and ends without stretching its premise thin. Frankenweenie is never a boring film, there is too much happening on screen, but it loses purpose as it gets towards the end. Screenwriter John August, another Burton regular, is only able to go so far before running out of better ideas, leaving the film with little to work with and an overall message that does not quite sit right with me. My key issue with this film is really in how it sets up its third act. We get to a point where the other kids all have pets being brought back to life, which leads to the monstrous versions of these pets running around and breaking things, with no real purpose, causing people to panic. ParaNorman succeeds in its third act, because it manages to take a similar scenario, involving monsters and town panic, and apply purpose to why things play out the way they do (that film also has way better messages to share). 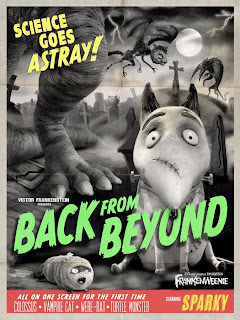 It is the main reason why Frankenweenie will have to settle for second place when it comes to 2012 stop-animated children’s monster films (my new favorite sub-genre). 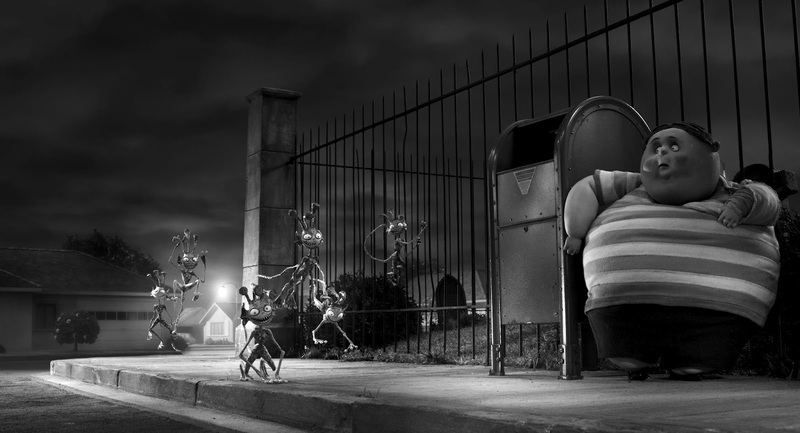 Frankenweenie still manages to succeed in many other areas, making it a fine film overall. 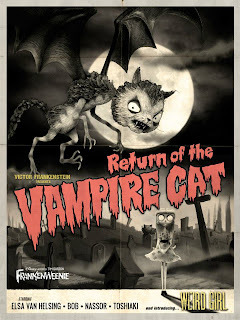 The animation looks great, the humor is a mix of being charmingly loony in some moments and humorously morbid in a Tim Burton sort of way, and the ode to old school horror is welcome. While there is not enough material for stronger plot to develop before reaching its finish, the movie at least has a nice story about a boy who loves his dog at its core. The other messages in this film may go either way (sure, science is important, but learning how to move on is not really a priority here apparently), but the good-natured approach makes up for it. I was mostly happy to be back in a world that seemed to come straight from the mind of Tim Burton and while Frankenweenie may be a slight effort, it is still an enjoyable one. Weird Girl: Something big is going to happen. Mr. Whiskers left a message. Victor: Did you get that out of the litter box?